Yet crucial decisions about these North American energy resources must be made by citizen legislators from these areas. These legislators have relatively few full-time resources to deal with the mind-boggling complexity of energy and environmental policies. On the other hand these men and women are nearly all quite accomplished in some walk of life, and they hold the equivalent of a Ph.D. in the “applied sociology” of their districts. Very few of them have a professional/technical background in the energy field, let alone ever had the need to develop an integrated picture of fast-changing international energy markets, energy transportation infrastructure, environmental impacts and mitigation issues of energy development, and many other advanced technical issues. So, where do they get their information to cast their votes? They could defer to a state or provincial executive (governor or premier) and the large bureaucracy those executives wield. But why go to the trouble of getting elected if functionally your role is to nearly always just say yes to something thought of, proposed and developed by somebody else? They could defer to non-government organizations (environmental groups, ratepayers, think tanks, unions, etc. ), but input from those sources is designed to be weighted to particular interests, not to balance all energy and environmental issues considered for all public interests. Or they could defer to the energy producers, trade groups, and businesses. But this broad grouping has many competing proposals and desires, and their paramount interest is maximizing the profit or value of their private assets. While these are, in fact, the sources that principally inform state and provincial legislatures, some legislators want to be able to become better informed themselves, and to compare impressions with others facing the same issues. The Center for Legislative Energy and Environmental Research (CLEER) is an organization that identifies technical experts on issues in the energy arena requested by state and provincial legislators. 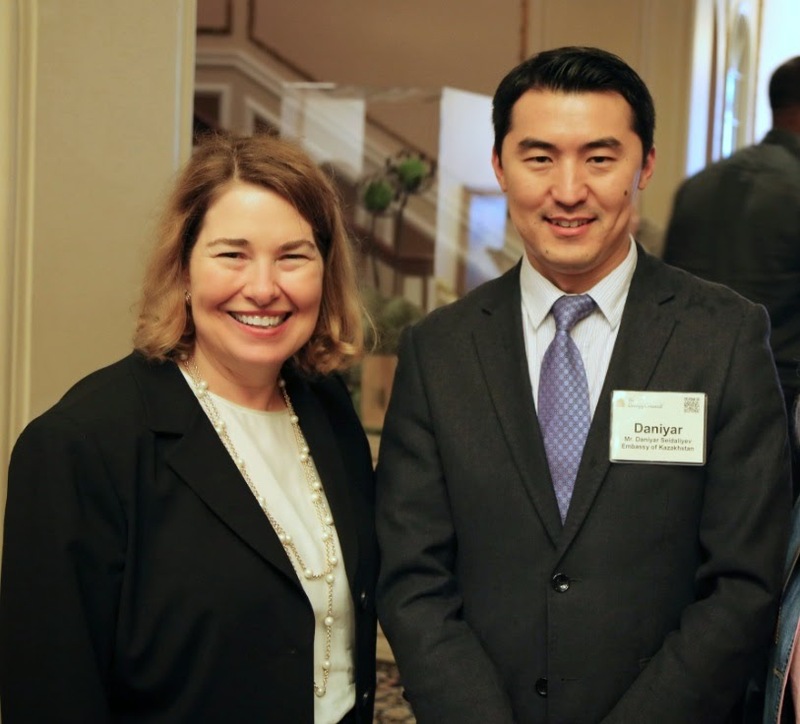 CLEER works with an organization of legislators to contribute to informational meetings that provide diverse perspectives on the economic, scientific, engineering, and public policy trends and challenges of energy and its effects on the environment. Former SNRAS Dean Carol Lewis served as the Alaska representative on the University Advisory Board to CLEER, and I serve in that role currently. With input from CLEER, the 2014 State and Provincial Trends in Energy and the Environment Conference took place in the Radisson Plaza Hotel in downtown Regina, Saskatchewan. The conference included a pre-meeting field trip to the Boundary Dan Carbon Capture facility near the North Dakota border, an evening reception at the RCMP Heritage Center, and a dinner at Government House with the Lieutenant Governor (Queen’s representative in the province). This article is a series of my personal impressions and observations from the conference, and it reflects only my judgments and opinions. There were too many excellent presentations at the conference to report on all of them in this article, so I have picked some topics that seem noteworthy overall, and some items that focus on the host location in Saskatchewan as a near-northern near-neighbor of Alaska. A pre-meeting trip visited what will be the first full-scale carbon capture demonstration from a coal (lignite) electric generation facility in the world. The “Boundary Dam Integrated Carbon Capture and Storage Demonstration Project” is located on a tributary of the Souris River near the Saskatchewan – North Dakota line. It will use what may be revolutionary technology developed at the Saskatchewan Research Center, University of Regina. The project is a retrofit of coal-fired electric generating Unit 3 for carbon capture (1 mill tonnes annually) and CO2 injection for enhanced oil recovery. The electric generation unit went online during the conference and the carbon capture unit will be tested up to full operation over the next two or three months. The project cost $1.4 billion, with $240 provided by the Canadian federal government. Operation of the carbon capture unit will reduce the output of Unit 3 from 139 MW to 110 MW, but if it operates as designed, it would retain the cost advantage of coal over even cheap natural gas in electric generation. Boundary Dam electric generation Unit 3 (left) retrofit with $1.4 bill. 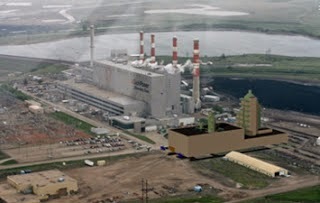 carbon capture addition (right), near Estevan, Saskatchewan, Canada. 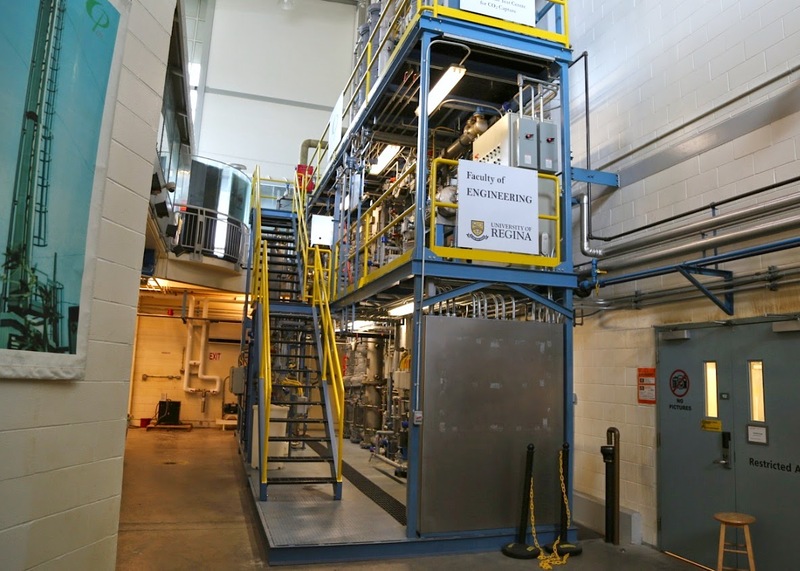 Mid-scale test of carbon capture unit, Petroleum Technology Research Centre, University of Regina, Saskatchewan, Canada. Entrance to University of Regina Petroleum Technology Research Centre. 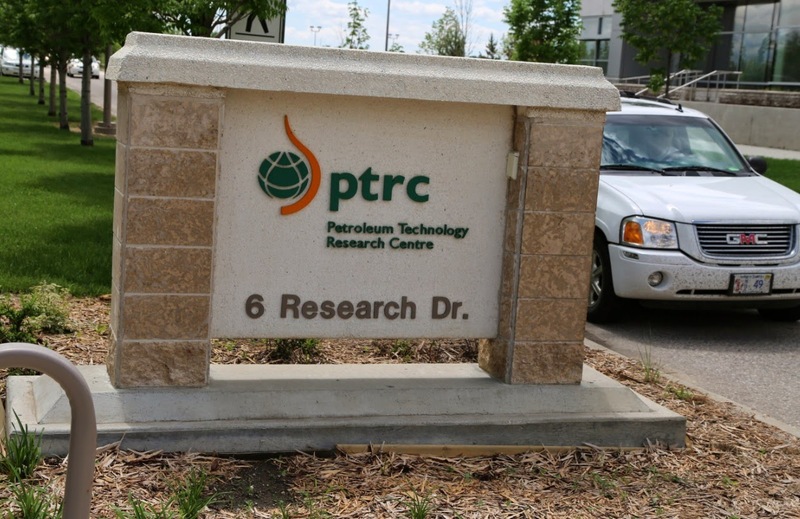 Much of the work at PTRC involves proprietary investigations into stimulating petroleum, especially oil and gas liquids, to flow from tightly held source rocks such as shales. Investigators also look into how carbon dioxide can be injected into petroleum formations (to enhance oil recovery) and safely stored in the host rock. The famous Bakken formation, the largest continuous oil accumulation assessed by USGS in the US to date (Gaswirth et al. 2013), extends into Saskatchewan and is a prime example of a tight oil formation. As ironic as it may seem, conference attendees were told that there is actually a shortage of commercially available carbon dioxide for use in enhanced oil recovery in North America, especially in the center of the continent. Because the work output of the PTRC has been focused on incremental engineering steps that are confidential and patentable, it has not developed the recognition and profile among academic peers that it may eventually obtain. A breakthrough in one of its other areas of work could change that. Much of the engineering technology for the Boundary Dam Integrated Carbon Capture and Storage Demonstration Project (see first item in this article) was developed at PTRC. Investigators and staff are excited about the efficiency of their process for capturing carbon dioxide from flue gasses, which involves steam injection and a recycling amine-based catalyst. But carbon capture as a policy has drawn criticism on scientific, technical, and policy grounds, and the history of carbon capture and storage technology includes promising approaches that, to date, largely have not worked (http://cdn.globalccsinstitute.com/sites/default/files/publications/116211/global-status-ccs-2013.pdf). On the other hand, it’s essentially a must-solve problem, lending more than a little drama to the quest. Initial results from the full-scale application of the PRTC carbon capture process at the Boundary Dam project should be available in the fall. 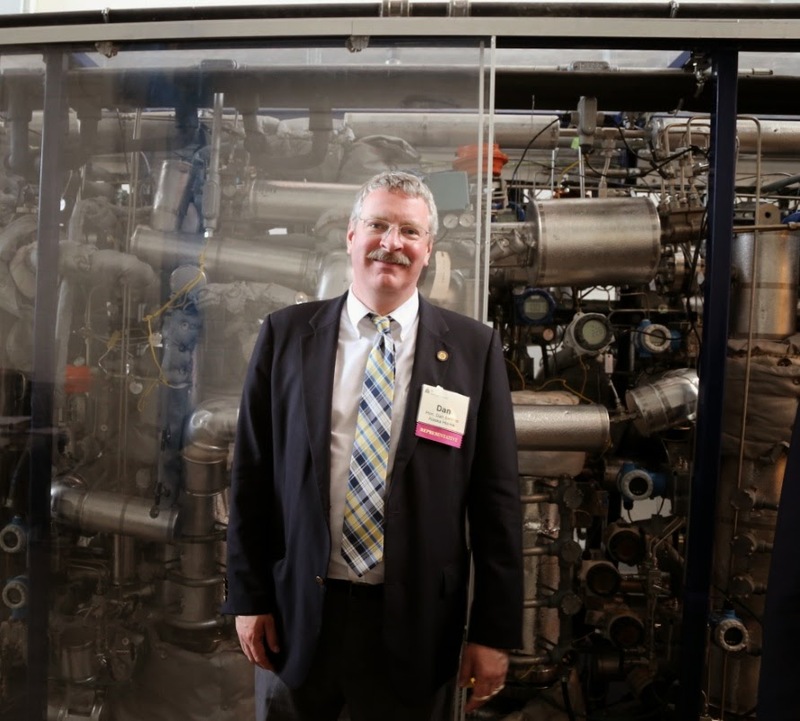 Alaska State Rep. Dan Saddler (R – Eagle River) at University of Regina, Petroleum Research Technology Center. In 2013 the province of Saskatchewan experienced the second-greatest population increase in Canada. Until the 1940s, Saskatchewan supported the third largest population among Canadian provinces, but since the 1920s the population remained at about 1 million, and then the province fell to sixth or lower. Today the population is over 1.1 million for the first time, and is expected to reach 1.2 million in about five years. The province is booming (4 percent growth in GDP in 2013) from development of abundant energy resources, resource and energy technology, and stable agricultural (wheat), potash, and forestry sectors. In-migration is high and foreign migrants are prominent in the economy of the capital, Regina. Many people in the U.S. are not aware that provinces other than Alberta were participating in the Canadian portion of the North American energy boom. Saskatchewan definitely is – in a very big way. Jeff Hryhoriw, from Cameco Corporation, gave an overview of the uranium production and electric generation sector. Since the Fukushima meltdowns and radioactivity release, Japan has taken 54 reactors offline and Germany 8. However there are currently 433 operable reactors worldwide, with a solid forecast of 93 net new reactors by 2023. The “Megatons to Megawatts” program ended in 2013 and 24 million pounds of annual uranium fuel supply previously obtained from recycling Cold War nuclear weapons is no longer coming onto the market. In the next decade about 15 percent of uranium power fuel demand will need to be filled by new supply. The province of Saskatchewan is responsible for 15 percent of the world’s uranium production. The significant Canadian producers include Cameco, whose uranium powers one out of 18 homes in the U.S. and is Canada’s largest industrial employer of aboriginal people. AREVA Resources Canada is another major producer in the province. The currently delineated reserves of the McAurthur River mine alone hold the energy equivalent of 71 billion barrels of oil, or enough to meet 7percent of U.S. electric demand. The surface footprint of the mine is not much more than 100 acres. In 2001, the northern half of the province of Saskatchewan (Census District 18) had a population of only 36,557, nearly all of them Athabascan Cree and Métis. The Athabascan Cree people make up about half of the uranium mining industry workforce. Northern Saskatchewan businesses supply about 70 percent of services to the mines. The other major uranium exporter in addition to Canada is Kazakhstan, through the government enterprise Kazatomprom. Cameco Canada has a joint venture with Kazatomprom at Inkai, which produces about 5.2 million pounds of uranium annually. Kazakhstan ambassadors and embassy employees have made a point of attending recent energy meetings in the U.S. and Canada. Lori Cameron, Executive Director of the organization of legislators with Daniyar Seidaliyev, Kazakhstan Embassy to Canada, June 2014, in Regina, Saskatchewan. The legislature of Saskatchewan is unicameral, that is it is composed of only one elected body rather than the typical bicameral arrangement of a House and Senate in the U.S. Conference attendees were given a tour of the Saskatchewan Legislative Assembly Building, one of if not the largest provincial legislative buildings in Canada. 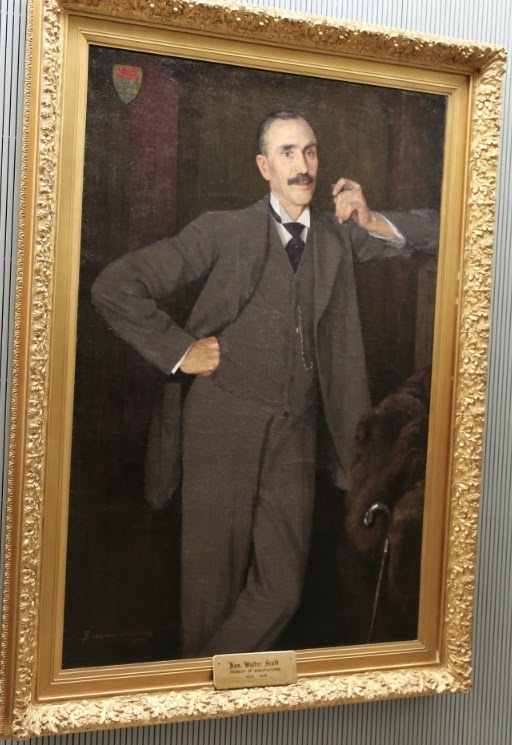 The first premiere of Saskatchewan, Thomas Walter Scott (1905-16), was convinced that Saskatchewan was going to have the largest or one of the largest populations in Canada, and so needed a large legislative building. Early events suggested he might be correct, with the province ranking #3 in population in the early 20th century, and developments such as the construction of a GM automobile assembly plant. Official portrait of first premiere of Saskatchewan, Thomas Walter Scott, Saskatchewan Legislative Building. 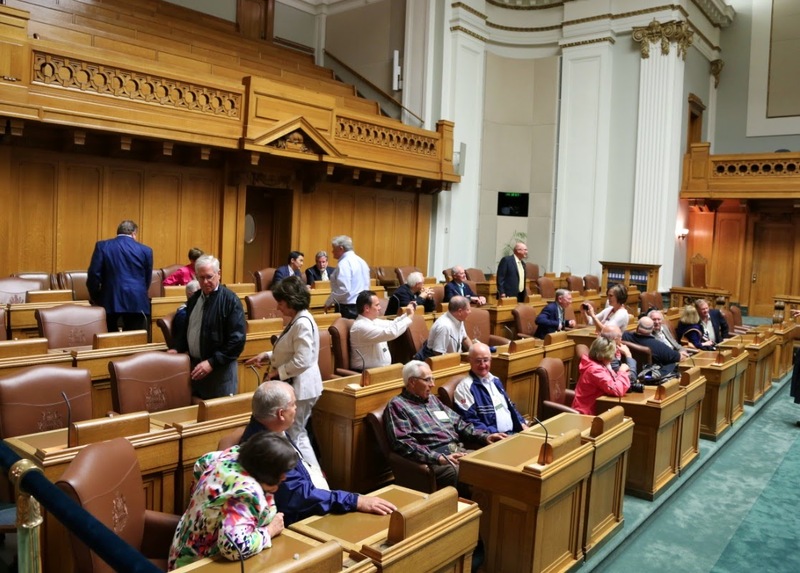 But in the post WWII period, Saskatchewan has lived a sort of culture of partially failed promise, and the large legislative building has been a key reminder of either shrunken performance or unrealistic ambitions. Given the recent booming economy, rapid growth, and the vast resource potential increasingly being commercialized, there is today a sense of anticipation about the promise of the province being fulfilled after a long delay. Those stable years, or if you prefer, stagnant years, largely coincide with governments under a classic socialist (government ownership of the means of production) political trend – the Cooperative Commonwealth Federation and its successor the New Democratic Party. In the agricultural arena, perhaps the best example was the Canadian Wheat Board, the sole legal purchaser of wheat from farmers in the Canadian Prairie Provinces from WWII until its recent privatization (http://en.wikipedia.org/wiki/Canadian_Wheat_Board). Although far from poor, the province of Saskatchewan gradually fell behind in relative economic activity in Canada during the decades following WWII. The stable political situation was decisively upset in 2007, as the newly formed center/right Saskatchewan Party won power with 38 of 58 seats. In 2011, the Saskatchewan Party won an historic landslide victory, winning 49 of 58 seats and re-electing all 18 cabinet ministers. 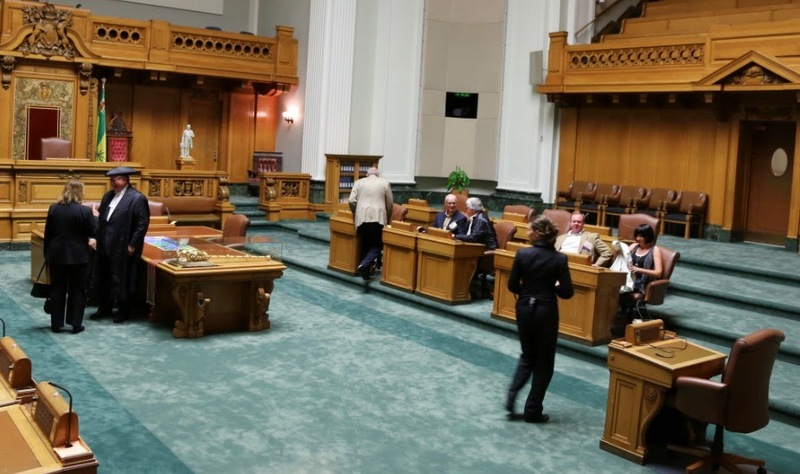 The nine desks on the opposition (left side) of the Speaker look somewhat forlorn compared to the crowd of 49 on the opposite (majority) side. Desks of the NDP opposition (top) and number of desks of the majority Saskatchewan Party (bottom). 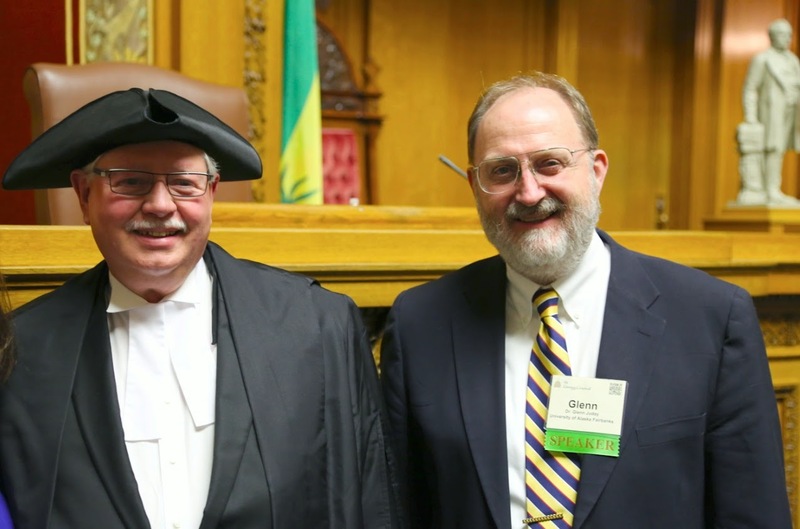 A conference speaker (right) with the Speaker (left) Hon. Dan Dan D'Autremont, MLA (Member of the Legislative assembly) for Cannington. Karen Hamberg, VP for Strategy, Westport, reported on the substantial inroads that natural gas is making as a transportation fuel. The economics are compelling as long as the U.S. retains something close to its massive current price advantage on a global basis. She identified the sectors that are leading the process of adoption of compressed natural gas/liquid natural gas (CNG/LNG) as high volume fuel-use fleets and transportation users seeking lower costs—not consumers driving individual vehicles. These include the “off road” sectors of mining, exploration and production, rail, and marine vehicles. The conversion of these vehicle fleets is about to assume very large dimensions, and seems likely to be completed in a matter of a few years, displacing a substantial amount of U.S. liquid fuel purchases. 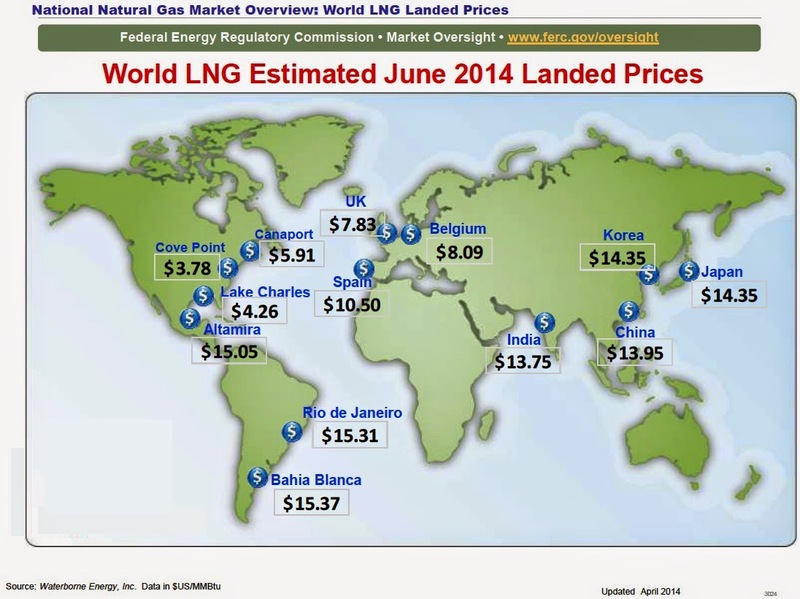 In general, cheap natural gas has made the U.S. Gulf of Mexico coast the low-cost refining center of the world, and a consolidation is underway as small refineries close, and large U.S. Gulf coast refineries expand and automate. The panel on renewable energy portfolio standards included three presenters. Dr. Bill Bachelor, Dean of Agriculture at Auburn University and Director of the Alabama Agricultural Experiment Station spoke of the evolving picture of farm-produced liquid biofuels. He traced the origin of the biofuel mandates to farmers seeking price support through government mandated blended fuel quotas (good in his view) rather than the general desire in the U.S. for energy independence or environmental benefit. He then pointed out the inflationary impact the mandates are now having on U.S. meat prices and world food costs. He outlined the historically direct and immediate relationship between food price spikes and subsequent food riots and overthrow of governments. He called for a loosening of the current high level of U.S. biofuel mandates to release grain to food production. He gave the opinion that cellulosic ethanol (his own research area) is now ready for at-scale engineering trials. Edward Finley, chairman of the North Carolina Utilities Commission spoke about the ambitious and strict renewable energy portfolio mandates that he was assigned to regulate and enforce. The implementation process required a lengthy and difficult series of public hearings in his state. He reported that his state’s utilities generally have been successful in fulfilling the renewable energy mandates for less cost than originally estimated, particularly because of the growth of the solar industry. The mandates came in 2007 from a Democratic legislature and governor, but since then the state’s politics underwent an historic conversion to a Republican governor and veto-proof Republican majorities in the legislature. He also explained the problems with renewable sources (e.g. few good wind locations, and most of them precluded by a statewide zoning ban on ridgetop construction, etc. ), and some severe cost issues of some renewables. A. Availability of the renewable energy source. B. Lack of technology (or efficiency of the technology). 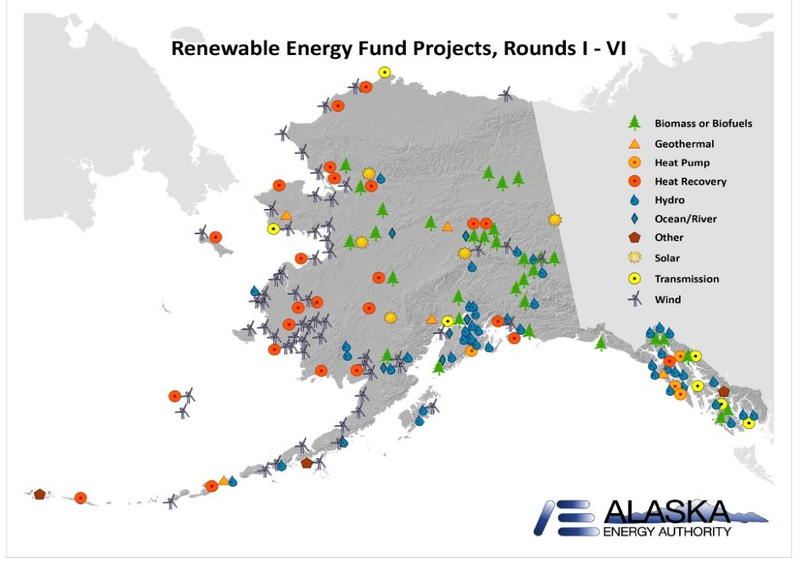 Geographic distribution of renewable energy projects by type in Alaska. I developed the contrast between a mandate or fiat approach to assembling a renewable energy portfolio (exemplified by North Carolina) and a “bottom-up” approach, such as the Alaska Energy Authority’s Renewable Energy Loan Program. I pointed out that, in fact, Alaska renewable projects probably had been limited by lack of available investment capital in many cases. I then described wood energy developments and savings in the off-grid villages of Tanana and Tok. Finally, I described the goals and approach of BAKLAP as an integrated research, education, and outreach project. I pointed out the additional achievements beyond renewable energy in the BAKLAP project, particularly teaching methodology and student learning outcomes. The province of Saskatchewan went all-out in terms of protocol for conference. Attendees were received at Government House, the residence of the Lieutenant Governor, Vaughn Schofield. Canada as an organized governmental entity originated from the British North America Act of the UK Parliament. As a result, Queen Elizabeth is the Head of State of Canada, as opposed to Head of Government, which is the Canadian Prime Minister. In the Canadian government, a ceremonial system is maintained in which the Queen gives royal assent to all the laws, acting at the provincial level through a lieutenant Governor as her representative in the province. Conference attendees from the U.S. were generally bemused at the elements of court protocol (addressing the Lt. Governor as “your honor,” the toast to the Queen, etc.). Like any official hospitality it was designed to strengthen relationships and increase regard for the host, and in the case of Saskatchewan it did. Decades ago, the topics of energy and the environment were largely, if not completely, quiet backwaters of state and provincial legislative policy making compared to taxes, budgets, criminal and civil law. Now energy and environmental issues can dominate the legislative agenda. This is especially the case in an era of fast-changing policy development on climate change and in the energy rich regions of North America - the continent that has now resumed its former leadership in global energy production. And to a degree essentially unique from the global perspective, the fateful decisions about North American energy matters are largely in the hands, not of entrenched social and political elites, but of the citizens – businessmen, teachers, lawyers, labor union members, retirees, professionals and others – elected by a citizenry that is itself struggling to learn in order to assert a well-informed sovereignty. I can’t think of a better example of the wisdom and utility of the mission assigned to the nation’s land grant universities and programs than the current North American energy and environmental situation. As stated by the 1862 Morrill Act a land grant program is dedicated to the teaching of practical agriculture, science, and engineering (“without excluding … classical studies”) in response to a rapidly industrializing world with fluid and mobile social classes, and to extending that knowledge to the citizens who need it. Gaswirth, S.B., Marra, K.R., Cook, T.A, Charpentier, R.R., Gautier, D.L., Higley, D.K., Klett, T.R., Lewan, M.D., Lillis, P.G., Schenk, C.J., Tennyson, M.E., and Whidden, K.J., 2013. Assessment of undiscovered oil resources in the Bakken and Three Forks Formations, Williston Basin Province, Montana, North Dakota, and South Dakota, 2013: U.S. Geological Survey Fact Sheet 2013–3013, 4 p., http://pubs.usgs.gov/fs/2013/3013/.